Michelangelo is in the midst of a reading frenzy, in the last three days he has read the first three Ranger’s Apprentice books🙂 He is reading every spare moment he has, which isn’t much as he is working on a building project with Dad, but by staying up late at night he is managing. Princess has also embarked on a reading binge, she reading her way through the Bobbsey Twins series. Actually the older three also constantly have their noses in books, Bryan Davis’ Dragons in our Midst books arrived so they are engrossed. Carpenter made the comment at breakfast that he feels like a Hobbit at present. He is certainly eating like a Hobbit. He eats a plate of leftovers and eggs before swimming at 5am, comes home and has a few slices of bacon and eggs, and then saddles up for a bowl of apple fruinola. Then within half an hour someone is bound to ask what if for lunch and what are we having for tea! I feel like a Hobbit chef!! It is 5.30pm as I type and I have changed Jem 6 times already today! How can one 2yr old boy generate so much washing?! He eats his breakfast, is covered in porridge and has to be changed – 1 outfit, he plays in the sandpit and turns on the hose – 2 outfits, he turns on the hose and runs under it – 1 outfit, he eats lunch and is covered in soup – 1 outfit, he runs in the rain- 1 outfit. Can we make it through till dinner? Why is it that this time of the year always seems to get so busy? In the next six weeks we have two 21st parties; one includes a 12 hour round trip, the other a three hour round trip, a birthday party, our Wedding Anniversary, 2 Christmas parties, the older three children complete their Bronze/Surf Live Saving training, which means every weekend at the beach for either Nippers or Bronze, PC starts his new job, we have three homeschooling social events, a doctor’s visit, a visit to our bigger city and Christmas shopping. Princess would like to join the Church choir for Christmas, just not sure how to fit it in. I’ve long been searching for a Literature Analysis program for Koala. Excellence in British Literature from IEW was recommended highly to me as was Windows to the World, despite my initial reluctance (I had previously been disappointed with Andrew Pudewa’s DVDs) I’m very impressed and may well have found what I’ve been searching for. The five oldest have been busy helping Dad with a major building project this week, their lessons have been of the non-academic kind, but valuable nonetheless. Stay tuned and I’ll explain all next week. Talking next week, it is our last with PC before he starts his new job, the time has just flown by. 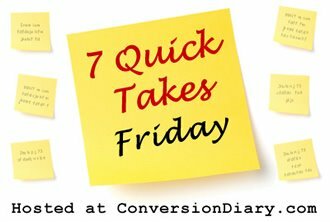 Visit Conversion Diary for more 7 Quick Takes. Yikes! # 4 just about makes my head spin! I do hope that you find some quiet time amidst all that rushing! Best to PC in his new employment ventures! Are Carpenter' swimming performances back up now with all the extra protein? love number 3 it is my 2 year old boy all over, only if we are staying at home we often give up changing and settle for very grumby. Trying to eliminate some activities.